Free shipping to United States with $130 purchase from thesugaredplums. See item details below for sale terms. View and approve a proof prior to production? Background Choice / Frame Color? Or, leave any text changes you may have here. Names, Dates, Quote, etc. Background choice (1-60), Mounted Frame Color(A-Y) Mounted Frame Vertical or Horizontal. You’ve reached the limit! Use 1024 characters or less. This unique Father of the Bride or Groom Personalized Picture Frame is the perfect way to display a favorite picture of you and your dad from your wedding day! 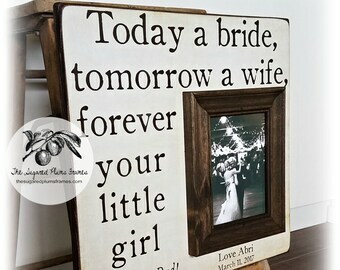 We can personalize it with your name(s) and date. Or you can write your own special message. 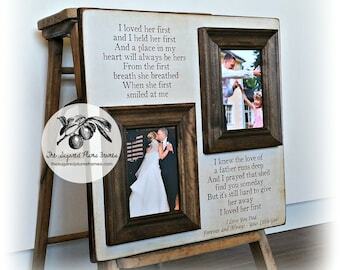 This listing is for a 16”x16”overall plaque with one 5”x7” mounted frame. If you selected the option to see a proof prior to production, please be sure to check your Etsy Conversations. You will receive a full color proof via Etsy Conversations within 2-3 business days. All proofs must be approved before we will proceed with your order. Wonderful to work with! We give these as coaches gifts and they are always well liked. Good quality frame and so many great options to choose from. It turned out so beautiful!! We were so very pleased! You will not be disappointed! Very easy to work with, great communication! Wonderful, wonderful experience! Thank you again so very much!!! How long does it take to receive my order-once it is placed? Our current turn around time is 1- 2 weeks (after approval of proof-if proof is requested). Need your order sooner than that? Send us a message and we will check our current schedule and get right back to you. Does the frame or sign come with hanging hardware attached? 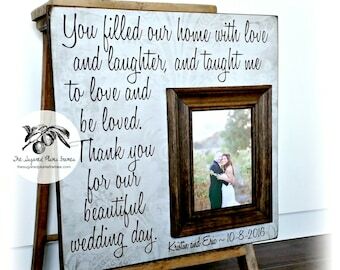 All frames and signs do come with hanging hardware attached so your frame or sign is ready to hang. Do I have to send you my picture when I order, or can I just insert it when I receive my frame? It is completely up to you. 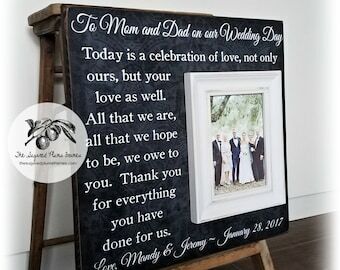 We are more than happy to print and insert your 4x6, 5x7, or 5x5 picture for you at no extra cost (this works out really well when the frame is sent directly to the recipient) or, you can insert it yourself when you receive your frame. It is super easy to change out your picture at any time. 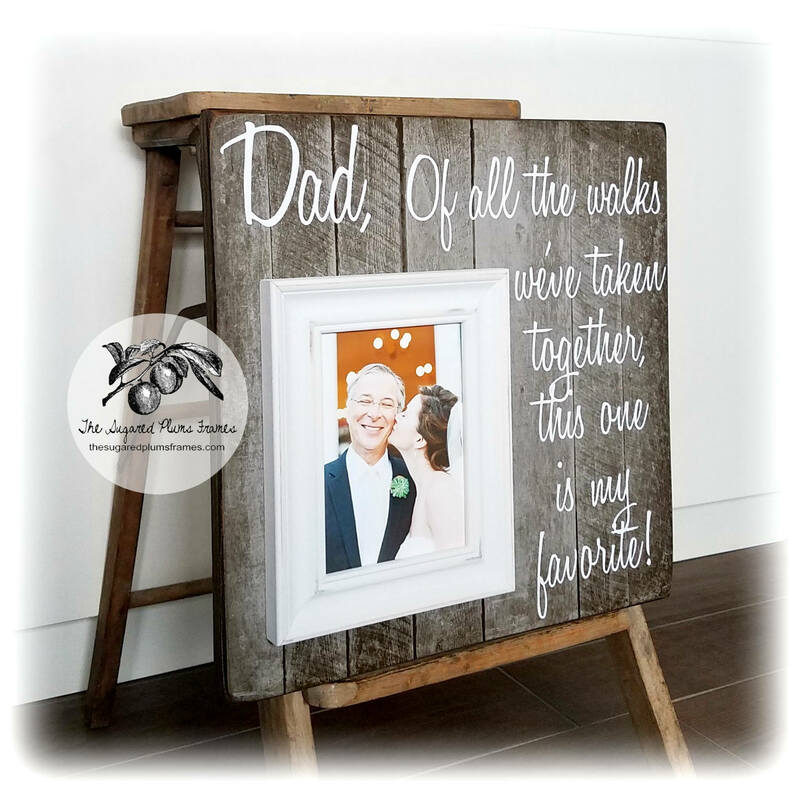 I actually hand-cut an opening out of the wood plaque so that you can easily insert your picture from the back (essentially just like a "regular frame"-glass and all!). If you would like me to include your picture, please send it to me as an attachment via Etsy conversations. How do I submit my custom information (i.e. name(s), date(s), text, etc? You will be prompted to leave your custom details/requests in the "Add Personalization Box" when you are checking-out. Is there a limit to the number of words I can have on my custom frame or sign?? Nope! We can make pretty much make anything “fit” the font may just have to be a little bit smaller. Do you have a “font list”? We actually don't have a font list because we are willing to use pretty much any font my customers may request. If you see something you like on one of our other listings-just copy and paste the link so we know which one it is. Or, if you have a particular style or you know the name of the font-just let us know. I don’t see the background I liked on your “background list” is it still available? Does the stand/ladder/easel come with the final piece? Do you give discounts if I order more than one frame or sign? We do offer multiple order discounts. If you order TWO or more items you receive FREE SHIPPING (automatically applied when checking out). Contact us if you are ordering three or more items and we will let you know about our additional discounts.